If you had walked past Glasgow's 02 ABC at around 4pm this evening, you would have been surprised to see a 50-strong crowd standing barefoot in the street. This shoe-less movement is commonplace at a Hanson show though, as the band rustle up local fans to take part in a mile-long walk of the city for Take the Walk almost everywhere they go. The barefoot walks raise money for Take Action, a charity which fights poverty and HIV/Aids in Africa, and the band have been supporting them since 2007. This is the first Glaswegian walk to take place, which saw a crowd of excited fans leave their shoes behind and follow the band towards Kelvingrove park. For a wet, windy afternoon - the turn out is admirable. Hanson is very grateful, but not particularly surprised. After all, a handful of fans have been waiting outside the venue since 6am just to nab a spot in the front row. The most interesting thing about these fans is that none of them are from Glasgow – or anywhere particularly close. Instead they've traveled from Belfast, Brighton, Dundee and London to name but a few. Not content with seeing the band play in Glasgow, these fans will follow Hanson across countries as they play a handful of UK dates – before moving on to mainland Europe. It's the kind of dedication that Taylor, Issac and Zac Hanson are used to - but always appreciative of. Taylor begins: "We've had a strong relationship with our fans for years - there's a familiarity there and, actually, we're spoiled. We look at an audience and we see a huge portion of the crowd is singing every world. It's not a casual thing." Issac adds: "For some reason, I liken this to the way we are about our set lists and the way we are about our music and our band. Although we can't really claim responsibility for it, it definitely seems like we have an unusually high number of people who are willing to do that sort of thing." Zac chips in: "We try not to take it for granted that people really care about what we do. They've stuck with us for 15, 20 years... this means something to them. We're lucky that we've had that kind of reaction." Issac mentions a girl he met earlier, who showed him a tattoo she'd gotten on her foot. She said that's the only Hanson tattoo she's gotten so far but that she'd "probably get more". Another girl is doing every date on the European tour, with the exception of just one show. Taylor hastened to add: "Not everybody's that way, but there's definitely a community." 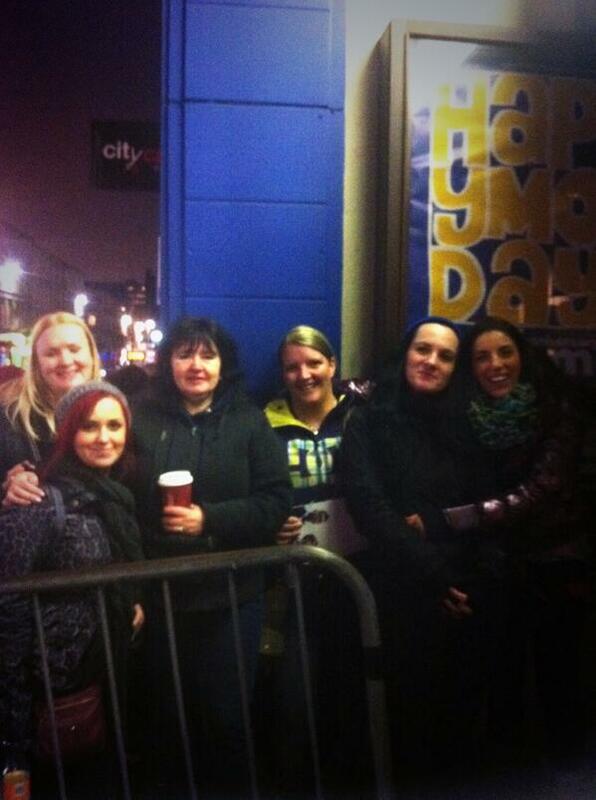 Met this group of dedicated @hansonmusic fans who'd been in line since 6am to be at the front tonight. It's that community that has allowed Hanson to flourish over the years. Taylor says: "As the businesses changes, it's more about how you cultivate that direct connection. We do it through running our label, having a strong web community and through our fan club. It gives us a good foundation to navigate. "We were able to build an internet fan base before internet fan bases really existed. It was hugely because we had an opportunity to connect with our peers, when they were emerging into that world. "The first era was about ten years ago, when people became fully saturated into that technology. Labels were screaming and fighting that transition, instead of embracing it. The playing field is beginning to truly start over and the content creator - in our case, the band - is in a totally new position. The cost to get out there is way less than it used to be." This do-it-yourself way of approaching their music is something that steered the band towards the position they're in now - recording music under their own label, 3CG Records. Hanson originally signed to Mercury in 1997, before the label merged with Def Jam Records. After the merger, the band quickly realised that they didn't want to be there anymore. Issac puts it simply: "They didn't care about what we were doing." Zac adds: "Def Jam wasn't a good place for us - they just acquired us as an asset." In terms of choosing to record under their own label, Zac adds: "We wanted to be on the side of the business that was growing, instead of the side that was shrinking." Taylor brings the conversation back to a positive note: "For us, we're able to keep the same trajectory we've always had. We've always made music that we're passionate about - we've never made an album that wasn't ours." Releasing Anthem, the band's ninth studio album, in July - the band are well-versed in the art of writing, recording and touring. But which aspect of being musicians do they prefer? Issac answers: "I don't think you can separate one from the other. Creating is a very introverted process, while touring is very extroverted... the road gives you energy to create new material." Taylor agrees: "One fuels the other. You can't not create but [with touring] you get to test yourself as a performer - it's a way of looking out into the world and understanding what your audience reacts to. "One of the most interesting tours is when you go out and play to an audience that aren't your fans. As an early band, you're tested by walking out to a bunch of people who couldn't care less. When they don't sing back, you have to do something different." The band are no stranger to touring - after all, they've been together for 21 years - but this is the first time Hanson have visited Glasgow since 2005. Taylor still remembers the first time the band played the city: "We played King Tuts in 2003. It was this tiny little acoustic show and you could touch the ceiling from the stage. By the time the show got going, it had this really intense, amazing energy." On Anthem, the band cite influences like James Brown and AC/DC - but do they draw influence from any current artists? Taylor answers: "Honestly, a lot of current artists we love are influenced by the bands we're talking about. When we talk about influences, it's a way of trying to describe what the music sounds like - but it's hard to describe music until you hear it. "We recorded [Anthem] live off the floor mostly and, when you make a record that way, you're trying to capture something that happens in a very real way. When it's really right, the listener can hear it. When three people sing around one mic, it's different than when each voice records parts of the harmony separately. "Anthem is a bigger and more intense-sounding album. The influences are still harking back to our core - good melody and hooks that stick out - but with a slightly harder edge." Zac considers this: "It's not that there aren't current artists that we listen to, like and feel inspired by. But [bands like AC/DC] are timeless. They set a bar - like, no matter what you're doing, you have to be that good. I wouldn't call anyone an influence until they reach a maturity of their own and stand the test of time. 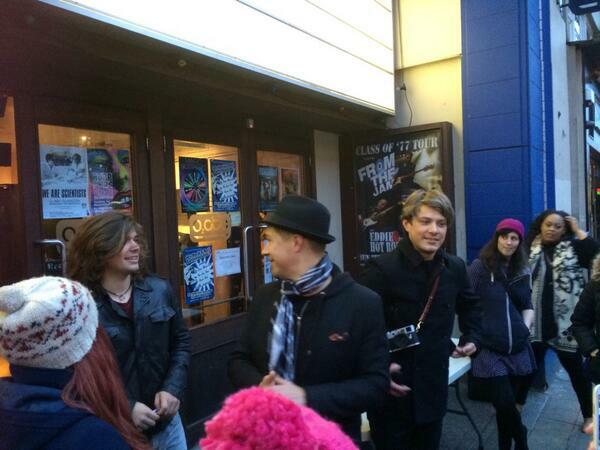 What does the new year have in store for Hanson then? Taylor answers simply: "Lots of touring". Hanson promised the fans a world tour following the release of Anthem and they're still in the process of delivering that promise. Next year the band will tick Asia and Australia off the list but, unfortunately, rule out another trip to the UK in 2014. Zac thinks ahead: "The main thing is that we're going to start on whatever's next... there will be new music next year." Now though, it's time to soundcheck - because you can't finish a European tour if you don't start it. Are you going to see Hanson tonight? Tweet us @STVGlasgowor find us on Facebook.